Byron Jones Breaks Standing Broad Jump World Record With 147-Inch Jump And Records A World Record 2,578 MEARS! On February 25, 2015, Sensational Cornerback Byron Jones of U-Conn went through the Entire 2015 NFL Scouting Combine, Impressing Most Every Single One of The NFL Scouts at every Combine Station and He Ended the Day with a Mind-Boggling, Unbelievable 2,578 MEARS RATING and in The Process, he also Broke The World Record in The Standing Broad Jump With his “Out-Of-This-World” 147-Inch Standing Broad Jump or 12-Foot, 3-Inch (In The Photo). Jones also did an Equally Incredible in The 3.94 Pro-Agility Shuttle and Equally Impressive and Mind-Boggling 44-5 Vertical Jump. Jones Recently Signed an $8.6M Four-Year Contract with The Dallas Cowboys, giving more Credence in having Great and Accurate Measurables. 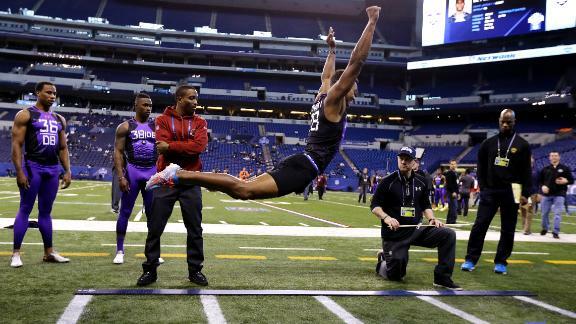 Jones Set the Record in The Standing Broad Jump at The 2015 NFL Combine at Lucas Oil Stadium in Indianapolis. The World Record was 12-Foot, 2-Inch, Set by Norwegian Arne Tvervaag in 1968. The Standing Broad Jump is Rarely Performed these days and it Has Not Been an Olympic Event in about 100-Years, so it is Rather Difficult to find Reliable Records for it, but Tveraag was Regarded as The Record Holder. Buffalo Bills Wide Receiver Marquise Goodwin, who was a Two-Time NCAA Long Jump Champion for The Texas Longhorns and He Qualified for The 2012 Olympics, Long Jumped 11-Feet at The 2013 NFL Combine, making his Long Jump Even More Impressive. All of The NFL Scouts who saw Jones Record His Incredible 44.5-Inch Vertical Jump, which was a Half-Inch off of The NFL Scouting Combine Record that was Set in 2014, will have some Great Memories. Clemson Super Linebacker Vic Beasley Also Broke THE MEARS WORLD RECORD WITH 2,492 MEARS RATING! 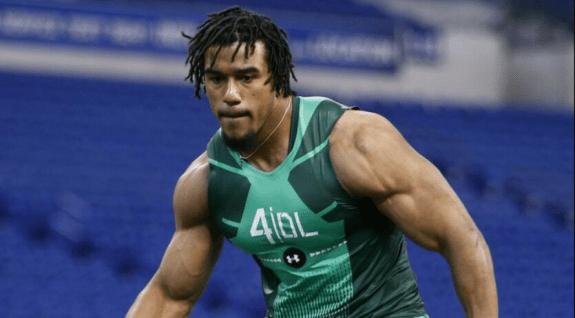 Outside Linebacker/Defensive End Clemson Super Combine Freak Vic Beasley Was The Talk of The 2015 NFL Scouting Combine. Beasley was Drafted By The Atlanta Falcons. Beasley did a 4.45 Forty; a 41-Inch Vertical Jump; and a 4.15 Pro-Shuttle; as he Also Recorded An Incredible 2,496 MEARS RATING! Alabama Super Wide Receiver Amari Cooper Also Broke THE MEARS RATING WITH A 2,467 MEARS RATING! Super Alabama Wide Receiver Amari Cooper was also one of Most-Talked About Players at The 2015 NFL Combine and He Did Not Let Any of The NFL Scouts-Down or Disappointed as he Ran an Incredible 4.35 Forty and Then Ran a 4.26 Forty at Alabama Pro Day. Cooper (#9) had a SEC Record Season With 124 Catches for 1,727-Yards and 16 Touchdowns as a Junior for The Crimson Tide in his Last Season. Cooper also became The Alabama All-Time Career Leader in Catches with 229; Receiving Yards with 3,463-Yards; and Receiving Touchdowns with 31 Touchdowns. Cooper was a Finalist for The Heisman Trophy Award; Won The Fred Biletnikoff Award; and was also a Unanimous All-American Wide Receiver. These 2015 NFL First Round Draft Choices Might Be The Most Incredible Group Ever! 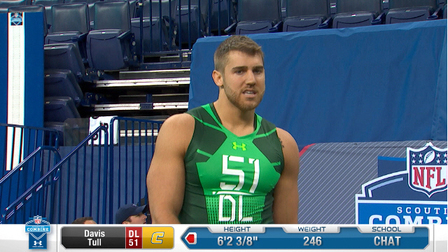 Still Another NFL Super Combine Freak Was Outside Linebacker Davis Tull of Tennessee Chattanooga! In the Photo, Tull Records An Incredible 42.5 Vertical Jump to Add To An Also Equally Incredible 4.32 Pro Shuttle and a 132-Inch Standing Broad Jump. Tull, Drafted by The New Orleans Saints, Recorded An Unbelievable 2,452 MEARS RATING. Tull Recently Signed a $2.5M Contract With the Saints, Adding more Credence for Accurate And Outstanding Measurables. In the 2015 NFL Draft, there were Twenty-Four Players that reached The 2,300 MEARS RATING Plateau and Fifty-Four Players that reached the 2,200 MEARS RATING Plateau. Below are the Twenty-Five Players with all of their Measurables, and with Their MEARS RATINGS, and Other Draft Info. Byron Jones is the Guy that you want on your Team! Below are the other Fifty-Four Players that Reached the 2,200 MEARS RATINGS with their Measurables. I took a Special Interest in Two Undrafted Free Agent Players. Super Tight End Will Tye, who Played in Our 2015 All-American Bowl Game Classic and Super Wide Receiver Jaxon Shipley, who was From my Hometown, Brownwood, Texas. One of The Super-Stars from The 2010 All-American Bowl Game was Tight End Will Tye (6-2, 257, 4.47, 31.5, 4.32, 112) From Salisbury Xavier, Connecticut. Tye was So Impressive at our First All-American Bowl Game Practice, Our East Head Coach, Coach Mike Bennett, Called Florida State, on The Practice Field and The Seminoles Offered. Tye (#44) was an MVP Tight End on The East Team and he Signed with Florida State, but After Two Years, he Transferred To Stony Brook University where he was Outstanding in Making All-American. At Stony Brook, In His Two seasons as a Seawolf, Tye Recorded 79 Catches for 1,015-Yards and Nine Touchdowns. Tye Also Recorded Some Incredible Measurables and He Signed With The NFL New York Giants as an Undrafted Free Agent. Super Texas Longhorn Wide Receiver Jaxon Shipley (#8) Started 35 Games For The Longhorns in his Four Year Career and he Finished near the top of a Multiple of Longhorn Career Receiving Records. His 218 Career Receptions Rank Third in The Longhorns Career Record Book and he was also Ranked Sixth on The Longhorns All-Time Career List with 2,510-Yards Receiving. Another Incredible Stat by Shipley was that He Caught a Pass in an Incredible and Amazing 47 of 48 Career Longhorn Games. After being an Undrafted Free Agent in The 2015 NFL Draft, Shipley Signed With The NFL Arizona Cardinals as an Undrafted Free Agent. In the first previous Eleven Games, The All-American Bowl Game Classic Has Helped Over 1,800, Under The College Coaches Recruiting Radar, To-Get a Scholarship. The All-American Bowl Game Classic also has had some Very Distinguished Alumnus, including Two #1 Draft Choices; Two #2 Draft Choices; and Five #3 Draft Choices. Kareem Jackson, Alfred Morris, Lawrence Wilson, and Vick Ballard did not have a Single Scholarship Offer When they Reported for Their First All-American Bowl Game Football Practice. Andy Dalton and Joe Looney had only One Scholarship Offer. Damontre Moore and Lee Smith had Only Two Scholarship Offers. One of Our 2010 SUPER ELITE TOP GUN CAMP Players, Odell Beckham was a #1 Draft Choice in 2014 and Another SUPER ELITE TOP GUN CAMP Player, Ameer Abdullah was a #2 Draft Choice in 2015. 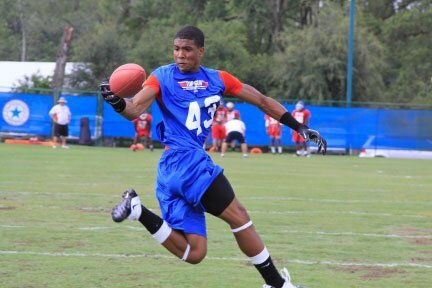 Neither Beckham or Abdullah had a Single Scholarship Offer at THE 2010 SUPER ELITE TOP GUN CAMP in Florida. Jeremy Hill, Jarvis Landry, and Anthony Chickillo had Several Offers and Hill was Committed to LSU when he came to our First Practice. Landry also Played on My 2010 National 7on7 Team. Beckham (#43) Started as a True Freshman in 2011 for The LSU Tigers and he was a Freshman All-American. Beckham was also Selected as an NFL First Round Draft Choice by The New York Giants in The 2014 NFL Draft and it Came after a Very Impressive All-American Career with The LSU Tigers and then A Very Impressive 2014 NFL Scouting Combine. One Day, Mrs. Abdullah Called me and Asked me if I would Pick-Up Her Son on my way To Florida if she would Drive him to Mobile from Homewood, Alabama and Of Course, I Told her that I would, because I knew that Her Son, Ameer, was a Super-Freak. Ameer Abdullah (#8) did not have a Single Scholarship Offer when I Picked-Him-Up in Mobile, Alabama, on my way To Florida for The Super Elite Top Gun Camp, but he was So Sensational at Our Camp, he Received Several Scholarship Offers and he Signed with The Nebraska Cornhuskers. When he Left The Cornhuskers, he had Rushed for 4,588-Yards and Finished with The Second Most Rushing Yards in Nebraska Cornhusker History. I still would like to host a few Super Elite Top Gun Combine Camps before The 12th Annual 2016 All-American Bowl Game on Saturday Jan 2, and hopefully, it will be convenient for most of my Great Coaches to be able to attend and help in conjunction with the Saturday (Dec 26), Monday, (Dec 28) and/or Tuesday (Dec 29) before we meet on Tuesday December (Dec 29). Only One Super Combine Stadium is Set and that will be set at Joe Yenni Football Stadium in Metairie, Louisiana on either Saturday Dec 26 or Monday Dec 28. Other Tentative Super Combine Locations could include Gulfport, MS; Hartford, CT; and Chicago, IL. The Top Five MEARS RATINGS in Each Super Combine and other Super Combine Freaks Will Automatically Get Immediate Invitations to play in The 2016 All-American Bowl Game. There is also a great chance that we will play on ESPN TV and I Will know something soon. I am going to talk to The ADIDAS Reps again next week when I feel a little better. Our 2016 All-American Bowl Game Classic Might be The Greatest Ever.